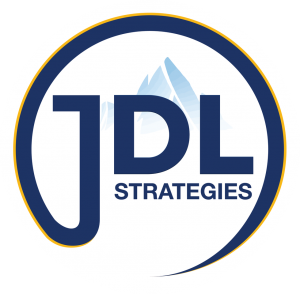 The information provided on this JDL Strategies Group web site has been compiled for your convenience. JDL Strategies Group makes no warranties about the accuracy or completeness of any information contained on this web site. JDL Strategies Group, including its directors, affiliates, officers, employees, agents, contractors, successors and assigns, will not accept any liability for any loss, damage or other injury resulting from its use. Links to other web sites are provided for your convenience and JDL Strategies Group is not responsible for the information contained on those web sites. The provision of a link to another web site does not constitute an endorsement or approval of that web site, or any products or services offered on that web site, by JDL Strategies Group. JDL Strategies Group will not accept any liability for the use of those links to connect to web sites that are not under our control. JDL Strategies Group, its directors, affiliates, officers, employees, agents, contractors, successors and assigns do not accept any liability: o for any investment decisions made on the basis of this information contained within this website. This web site does not constitute financial advice and should not be taken as such. JDL Strategies Group urges you to obtain professional advice before proceeding with any investment. o for any damages or losses whatsoever, arising out of, or in any way related to, the use of this site and any other site lined to this site. Nothing in this web site constitutes or is intended to constitute an offer of, or an invitation to purchase or subscribe for, securities. JDL Strategies Group holds the copyright to this web site. JDL Strategies Group grants you a limited licence to download this web site for personal use only. You are not permitted to reproduce or alter this web site, or any copy of it, for any other purpose without the prior express written consent of JDL Strategies Group. JDL Strategies Group reserves the right to make changes, modifications, additions, deletions and corrections to the web site, at any time and without notice. Financial Disclaimer JDL Strategies Group does not accept any liability for any investment decisions made on the basis of this information. This web site does not constitute financial advice and should not be taken as such. JDL Strategies Group urges you to obtain professional advice before proceeding with any investment. Any links have been provided for your convenience. Web sites which you are transferred to are not controlled by JDL Strategies Group and JDL Strategies Group is not responsible, and does not accept any liability, for the information contained on those web sites. The provision of a link does not constitute an endorsement or approval of that web site or any products or services on that web site. Please be advised that the JDL Strategies Group have an Alliance Program. If you have been referred to JDL Strategies by another party, they may receive a financial benefit should you become a client of JDL Strategies. You should be aware that you yourself may have the opportunity to become an Alliance and as such, JDL Strategies will pay it’s marketing component to the Alliance up to $2000 (+GST). JDL Strategies group of companies (the “Group”). The Group includes all of our financial planning, insurance, broking, finance, accounting, technological, superannuation, and fund management affiliates. These are: Asset Realty; JDL Finance; and all related alliances.